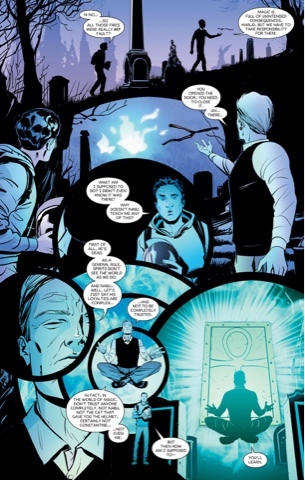 New Dr Fate Khalid Nassour is tying up loose ends - a door into the realm of the dead, left open when he returned from the afterlife. A djinn having followed him through and tried to burn down New York, Khalid must make sure no more horrors enter our world. 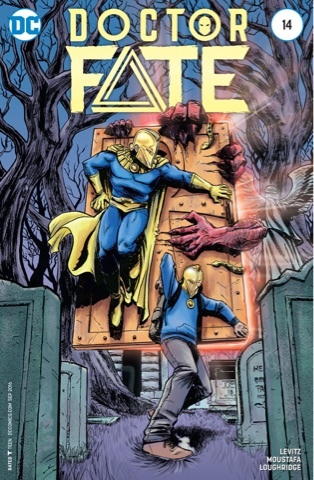 Guiding him - well, more chivvying - is his great-uncle Kent Nelson, the original Dr Fate. Khalid, rather reasonably, assumes they're teaming up. Not quite. Our tyro Fate has to figure things out for himself in Paul Levitz's smart tale. 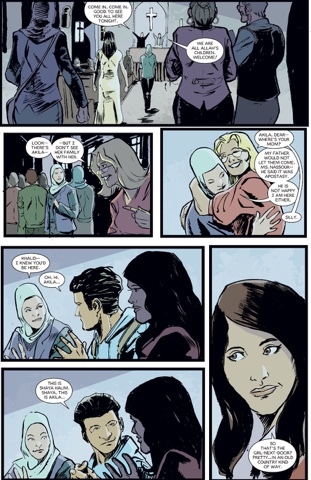 We also check in with his parents, Mohammed and Elizabeth, whose separate scenes aren't the most dramatic but add pleasing texture to the book. 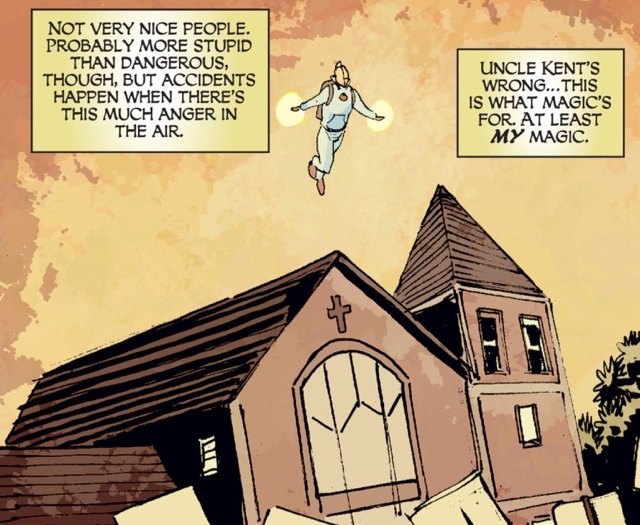 I had assumed Kent's recent arrival presaged Khalid losing his role, but in fact he's helping the younger mage grow in stature. Regular artist Sonny Liew, whose madly fluid stylings have given this series a unique visual identity, is away this issue, but Inaki Miranda fills the breach beautifully - his work hews a little more to the traditional superhero style but, like Liew, he has bags of imagination. Have you ever seen a more sheepish Egyptian demon? Eva de la Cruz's colours are simply lovely: cool graveyard blues broken up by the rainbow pastels of the hidden world: the naturalist tones of the New York night; the intense purples and reds as Khalid nears his goal... And Saida Temofonte employs a pleasing variety of complementary fonts to suit the characters and situations. 'A Hole in Reality' is a wonderfully tight tale, just 13 pages - if there was still an end-of-year Best of DC digest, it'd be a shoo-in. As would the second story in this format-breaker of an issue curated by editors David Wohl and Brian Cunningham. 'Reflection' is a tale for our times as Khalid, Mohammed, Elizabeth, Kent, girlfriend Shaya and would-be girlfriend Akila attend an interfaith service to show a united front against terrorism. The interaction between the characters is lovely to watch, with Shaya's assessment of Akila sending her right done in my estimation. This being a superhero comic, intellectual conflict is made manifest, as violent bigots disrupt proceedings, giving Khalid another chance to prove he's getting rather good at this magic lark. What he does isn't for me to reveal, let's just say it's one of the most creative uses of Fate's powers I've seen. Breno Tamura's art doesn't quite have the panel-to-panel flow of Miranda's storytelling but it works, the facial experiments and body language serving Levitz' script well. There's an indy naturalism I really like, and when magic comes into play Tamura - and always excellent colourist Lee Loughridge - nail it. Temofonte is back for letters duty and, once again, does a great job. The nigh-edible cover by Ibrahim Moustafa, who's also done great fill-in work on this book, really captures the frustrated stoicism of Khalid and the veteran attitude of Kent, while quickly summing up the situation. Khalid Nassour continues to be one of the best new characters of the last few years - he's not a genius, but his heart is big enough to show him how to use the power that comes with the helmet of Thoth. He's constantly appalled and bemused by the situations in which he finds himself, but finds the courage and poise to handle whatever is thrown at him. And little by little, he's learning to fill the boots of his great-uncle. This series ends soon, and I believe the original JSA is coming back, but I hope Khalid sticks around - even if he won't be Doctor Fate, he could be a darn good locum. I've really enjoyed this series and I'm a bit annoyed that we have to have everything reset to around 1984 again. I'm taking a 'wait and see' attitude - they may surprise us. I suspect Khalid will remain Fate when the JSA returns. If he wasn't going to be, I doubt DC would still be developing his character post-Rebirth. We'll see which Fate shows up in Blue Beetle soon... I expect that's what'll tell the tale. And yeah, a really great issue, Martin -- I love getting two stories in one issue! Good point, I forgot about the Blue Beetle thing - this week, we have the house ads, which have me excited. Amen to that, lose the hoodie, kid!